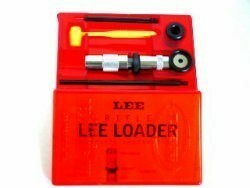 For over 50 years, more shooters have chosen the famous Lee Loader for their first reloading tool than any other. They realize it is all they need for good, accurate ammunition. In fact, at one time ammunition loaded with a Lee Loader held a world record listed in the Guinness Book of World Records for more than seven years. Millions upon millions of rounds have been reloaded with the famous Lee Loader, and we expect it will continue to be a popular reloader for many years to come. It's the perfect tool for those who wish to simply try reloading, because it will pay for itself in just an hour or so. The Lee Loader neck sizes only, use only with brass fired through your gun. You can reload a round in 30 seconds. Recommended if you’re loading for a bolt action rifle in small quantities. Find out for yourself how much fun it is to reload with the Lee Loader. Everything you need to begin loading one caliber and you'll save enough to pay for it in the first hour!